In a post on my personal ADU blog, I described an awesome building incentive that was made available for my ADU from the Energy Trust of Oregon (ETO). My ADU project was the first case in which an ADU was allowed into ETO’s New Homes program. Due to some forward thinking decision-making at ETO, they’ve altered their program to allow ‘most’ new detached ADUs to be eligible for these New Home incentives, regardless of who is going to be residing in the ADU. Previously, most ADUs had not been eligible for New Homes program because the ETO rules stated that that home (or ADU) had to be used as the homeowner’s primary residence; now, they’ve broadened their program to allow most new ADUs into the program. This is great news for anyone in ETO territory who is planning to build an ADU. By following the building guidelines laid out by the ETO, which basically means building to Northwest Energy Star standards, the ADU will be eligible for an amount that is commensurate with the efficiency of building techniques that are deployed. Depending on how efficiently you design and build an ADU, rebates could range from $800 to more than $3,000. 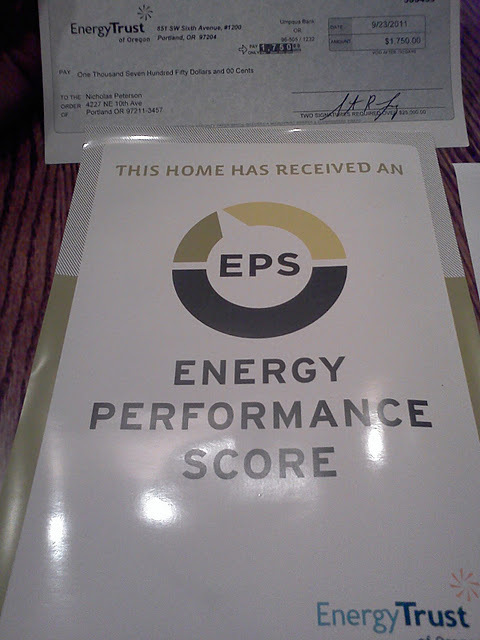 In my case, The $1,750 rebate that I received for my ADU was proportional to my low Energy Performance Score. 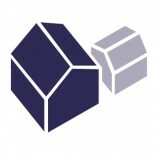 Think of EPS as a MPG for your house. Average sized new construction houses built to code in Oregon have an EPS of 101. The lower your EPS score, the better. ADUs are inherently small, and therefor, inherently, they use less less energy than most homes, and therefore, they are likely to have a relatively low EPS. My ADU has an EPS of 35. 3rd party certification that is part of the certification process ensures that the building is meeting high quality design and building standards. lastly, 3rd party green home certifications have been shown to have a significant impact on resale values for the homeowner. Here’s the new rules of the program. Contact ETO if you have more questions about your eligibility for this incentive. This is good news, Kol. I like how you have a photo of the actual check. This entry was posted on January 4, 2012 by Kol Peterson in Design & Build, Financing, News and tagged energy, financing, incentive, oregon, permitted.